These first five photos were taken atop Mt. Kamenjak in the Vrana Lake Nature Park in Croatia. 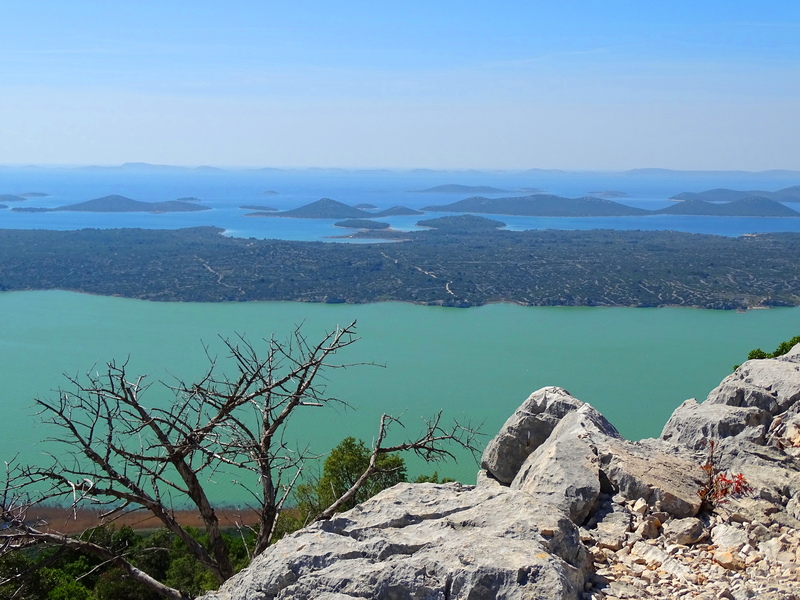 The amazing view you are seeing looks down over Lake Vrana towards the Kornati Islands in the Adriatic Sea. Lake Vrana, the greenish body of water in the forefront, lies on the Dalmatian coast, and is the largest lake in Croatia. It is separated from the sea by a mere 2 km strip of land which you can clearly see in this photo. The view from the opposite side of Mt. 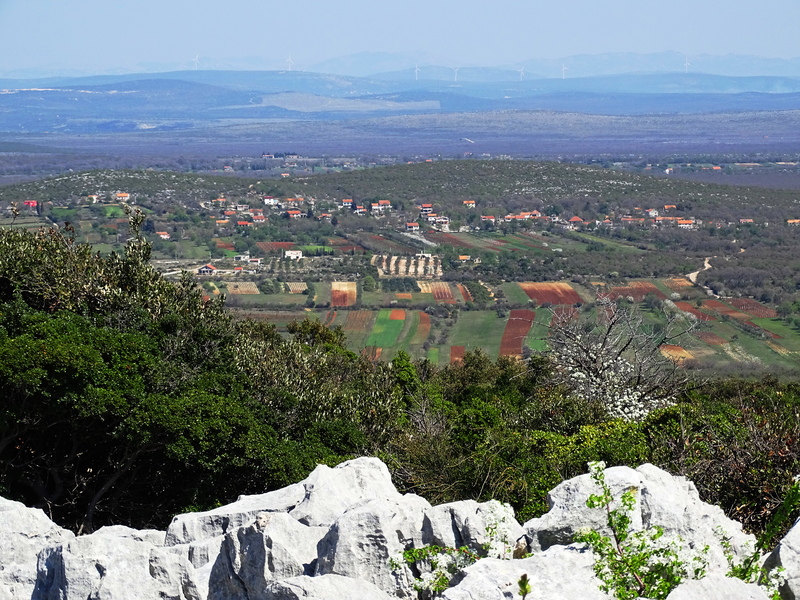 Kamenjak is also incredible, and looks into the interior of Croatia. It was quite special for me to visit this area of the world, because my grandfather, who emigrated to the US through Ellis Island in the early 1900’s, was from this area. The spectacular Mt. 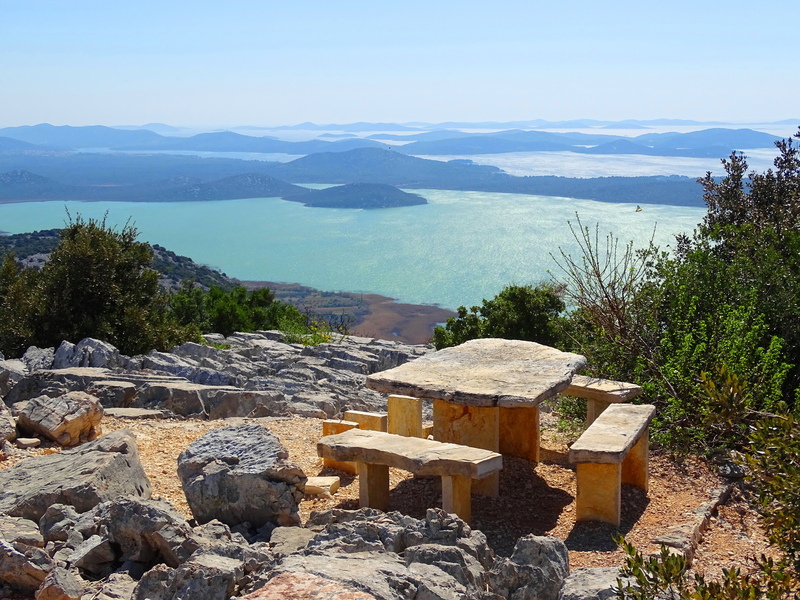 Kamenjak viewpoint is off the beaten track and less traveled. There is a charming old chapel, many hiking options, picnic facilities, and a place to order snacks if you didn’t bring a picnic. Lake Varna can be easily reached on a day trip from nearby Zadar, the oldest continuously occupied city in Croatia. 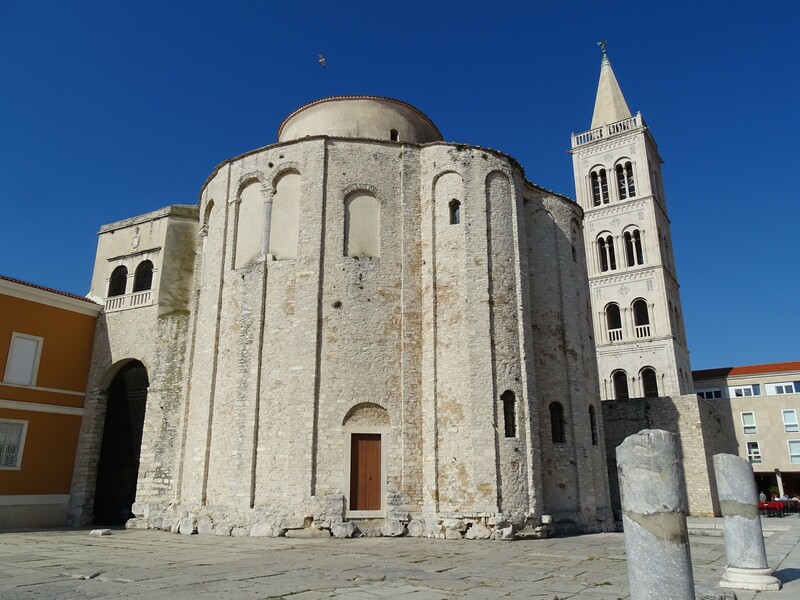 This is St. Donatus Church in Zadar, founded in the 9th Century. 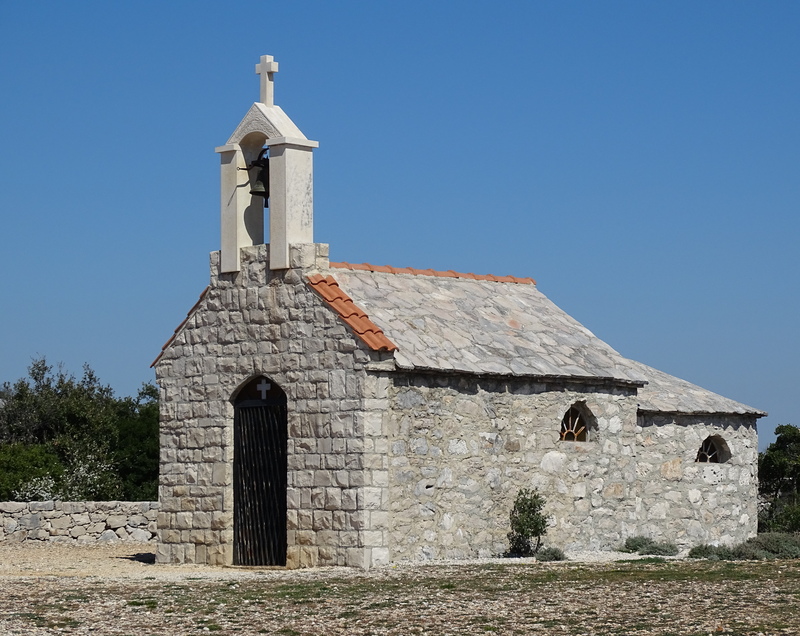 The small chapel is St. Mary’s Church, founded in 1066, and the ruins you see scattered about are the remnants of the largest Roman Forum in the Eastern Adriatic. 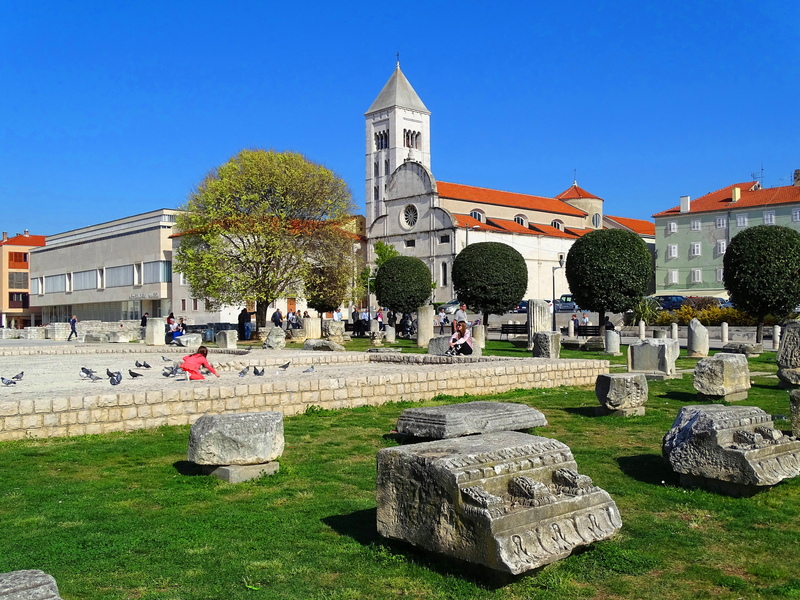 Zadar is the historical center of The Dalmatian Coast. It was founded by the Liburnians in the 4th Century BC, and numerous Neolithic settlements have been discovered here. Awww, I am so glad we traveled together! Beautiful pictures! I must take a trip to Croatia! Thanks my friend & cheers to you! Stunning vistas! The lake is a beauty. So unusual to see a lake resting along the sea! I have heard good things about Croatia. How wonderful you got to go back to your grandfathers roots. 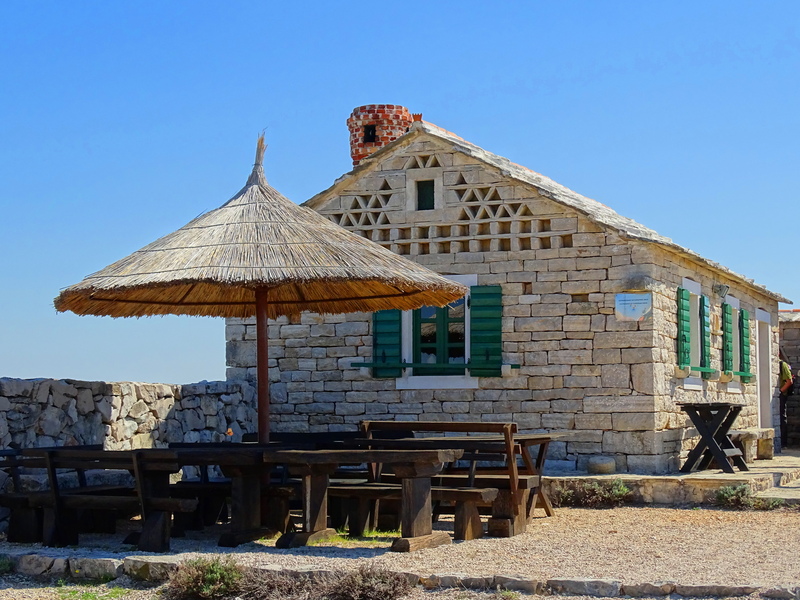 You mention the restaurants and local cuisine, which leaves me wondering what type of cuisine is typical of Croatia? It is a mixture of regions and this part of Europe, but it is basically food my grandmother and mother cooked, all influenced by my grandfather. It has a strong slavic influence, so there is goulash, yogurt sauces, lamb dishes, stuffed peppers, stuffed cabbage, bulgar pilafs, stews with veggies, meat and potatoes, Greek influenced foods, like Spanokpita and Mousakka, and on the coast seafood dishes. It is a gimmish, but definitely has it’s own unique character. My grandfather always made his own yogurt since it was not popular when I was young and it is used to make all sorts of sauces. Lots of eggplant and pomegranate too. Food, family, tradition, culture — a timeless combination. And I have experienced how nearby cultures influence each other too, especially when it comes to menu items and recipes. 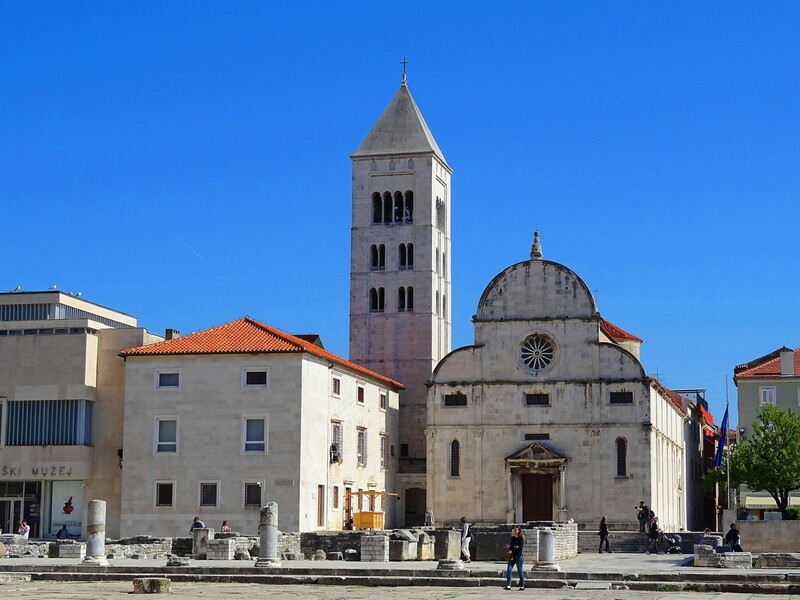 Very interesting pictures of Zadar. And the lake neighboring the sea. Or the sea guarding the lake. A special place! It’s own holler maybe? Actually two of them, depending on which way you look from up there, though both probably way too large for that special term. Nice trip, Cindy! You are generous to take us along. It a fabulous part of Europe for tourists to visit, much less crowded than the main tourist draws in Europe. It was very heavily damaged in WWII, so it is wonderful so much of it remains. You give this area a much needed photographic lift. It must feel good to connect with your heritage. I keep getting closer and closer to my roots, I need to go to Poland and more of Eastern Europe. So beautiful with crisp bright light. It was an interesting April in Europe, it started with several weeks of intense heat, and ended with snow! 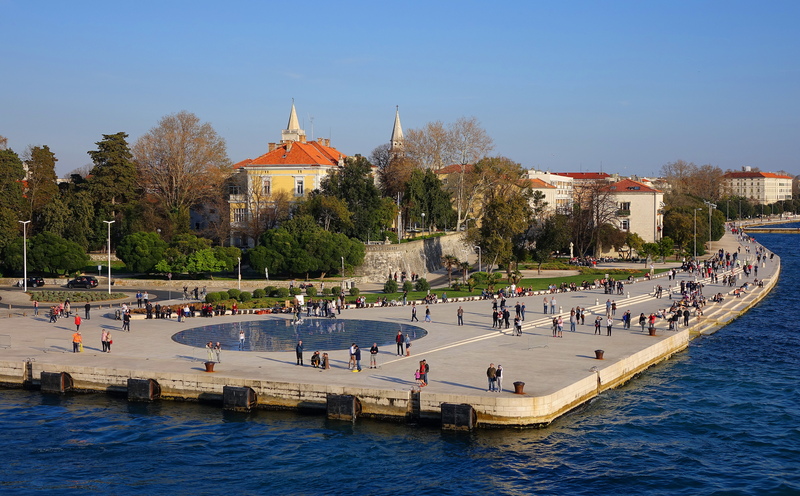 Fabulous photos of Zadar and the surrounding area. I well remember The Dalmation Coast from my 1976 trip around central Europe. It must have been amazing and so untraveled back then! What was amazing is that I travelled through areas before the Bosnian war and saw life as it was lived for hundreds of years (in the countryside in particular). I’ve thrown most of my lousy photos out now, but I did keep a couple of shots taken in Zadar and also when our bus broke down for a week on the Dalmation coast. (note: I was on a 9 week organised camping trip at that particular time). Unfortunately, the images, made with a little instamatic camera are too faded and yellowed to scan, and I only remember little snippets of the trip. Every time I read of someone’s travels I get out my few remaining photos and wish that they were better to share online. My memory has deteriorated so much too. One of the symptoms of my health condition. A recent brain MRI (because of my current severe headaches) showed quite some deterioration. When I was 19, a psychic told me I would visit Dubrovnik and about some of the people I would meet and travel with and at 23, when I booked that camping trip, I was surprised to see Dubrovnik on the list of towns on the eastern part of the tour. It’s not as though it was a well-known city like Rome for example. I remember the most odd snippets from my past. Almost nothing of my childhood at all. (I did wonder once whether I had early Alzheimers or something). You provided a lot of interesting leads here. If I were still working, I would want to explore the memory issues, but it sounds like you have it well in hand, and are following up on it, which is important. So sorry about the severe headaches. They must be exhausting. Your trip though sounds amazing. Somehow I suspect these ancient little towns may not have changed all that much and that is a comforting thought. There is definitely a strange feeling of familiarity when you go back to the home countries of your relatives. It feels almost like you are revisiting these places with them, and are a returnee, rather than just a tourist. Thanks for another virtual visit powered by fine photos of a beautiful place that was new to me. I am curious about the “sea organ that chimes in rhythm with the waves”. Is it something like wind chimes with the clapper in the water? Apart from the *Greeting to the Sun*, I did not see anything unusual on the quay. Croatia and this part of the world has such complicated history, and I do not pretend to understand it, or my grandfather’s family history, well. This is what I was told: My grandfather’s family owned a large poppy plantation, that I think was in Yugoslavia (Croatia was apparently once a province of Yugoslavia). The plantation was confiscated with communist rule. My grandfather stowed away on a ship to the US (interestingly, he became a prominent judge in Chicago, but stowed away here illegally), and the family scattered to Sofia Bulgaria where they still are now. My family name is Doscolov, Doscolova for the females. I wish a Doscolov would read this post and tell me more! I had an Uncle Alexander from Sofia, and who was the chair of the Universities Dept of Mathematics, that I met several times, and really especially liked. He would come on visitors visas and stay for several months, and I wrote regularly to him as a child. A wonderful place! I’m so glad you went to the birth land of your grandfather! 1066 was also the Battle Of Hastings. History is so interesting! Thank you for this lovely post! An area rich in history that we seldom hear about. Terrific scenery, too. Did you meet any cousins? Not this time. I have to go to Bulgaria to do that as they are all living there now. Beautiful pictures!!! Those first three, especially, took my breath away! What a great experience to see the area your grandfather came from. Beautiful pictures from the area your grandfather immigrated from! Thank you and very pleased you enjoyed! Breathtaking photos, Cindy! I love that little chapel. Did you get to go inside? You can look and take photos inside which I did, but you cannot go in. Churches are such interesting places and it seems no two are alike. I love the old ones. Looks like a lovely place! I love the green lake contrasting with the blue of the sea! Yes, the demarcation was interesting and due I would imagine to salinity levels. The lake is brackish due to salt water seepage. Thanks more for sharing them with me Val! Thanks for an amazing trip Cindy – so refreshing, enriching and uplifting. Wow! Crotia is beautiful! Is this where the Game of Thrones is shoot at? Yes, lots of it were. If you look at my Dubrovnik post you will recognize scenes from the series. Yes definitely heavier than terracotta. There was one stone building with no windows and I noticed the walls were stacked inside a frame that stopped the wall from toppling and the rocks had no cement holding them, just the frame and the cumulative weight of the rock. Remarkable! Awww, I am honored. Thank you! Very beautiful pictures Cindy. Hope you had a great time! Breathtaking photos, Cindy! So special to see where your grandfather came from! Beautifully stunning locations and architecture captured perfectly! Very happy you enjoyed & cheers to you! Thank you for pictures for me to save in the cloud. Or anywhere my server keeps them, a warehouse in New Jersey or anywhere else. To be enjoyed anywhere irregardless. Laughing! Thank you & wonderful weekend to you too! These are gorgeous photos of a fantastic setting. Enjoyed. Also, want to thank your for following “Renaissance Musings. Look forward to any input you have to offer. Croatia is beautiful, with lots of waterfall to just dive in. Very clean place, The photographs you took is awesome. Those structures are beautifully built.